New readers can definitely be forgiven for not recognizing Lance, Sam's former co-worker. The Reader's Guide should tell you everything you need to know, although it's no substitute for reading through the entire comic archive and throwing away hours of your life. You can't get the time back! The new shirts are up in the shop! I'm extremely happy with how they turned out, and I hope you are too. I killed a large portion of my weekend redesigning the t-shirt store from scratch, but it had to be done -- it was just getting too massive to cram onto a single page. Please let me know if anything in the shop is not working properly! Also, the Canadian government has politely informed me that I should be colleting sales taxes for them. This exciting new reality is reflected in a slight increase in shipping charges. I hate raising my prices. Friends, please don't let this discourage you from shopping in my store, because every extra cent is going to Paul Martin. We return on Wednesday! See you then! As usual, both designs will be available for a two week preorder period. I should have t-shirts, hoodies and babydolls for each design. I'll be back on Monday with the final versions of both shirts. By that time, I should also know the final location of the Dayfree Press booth at next month's San Diego Comic-Con. Have a good weekend! Tomorrow is the last day of production for the next issue of YES Mag. As usual, I got to do a few illustrations in addition to my designing duties. 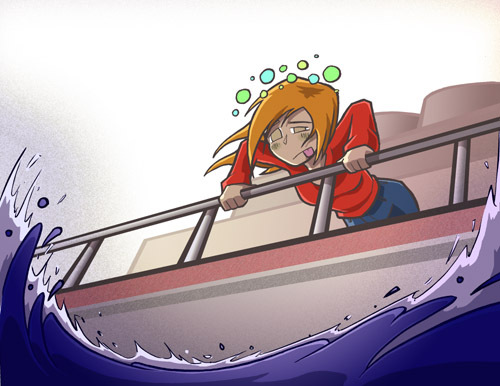 If you're interested, here's a preview of one for an article about sea sickness! For the next issue, I'll be orchestrating a total redesign of the magazine. It's going to be a big job, and I wish it didn't happen to fall at the same time as Comic Con. But I'm still going to do both anyway, because I am a machine. Be sure to come to San Diego this summer and visit the Incredible Exhausted Man at the Dayfree Press booth!